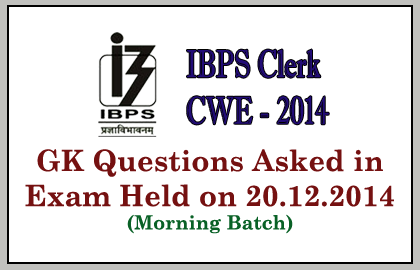 List of General Awareness Questions that asked in IBPS Clerk CWE 2014 held on 20th December 2014 (Morning Batch) were given below. Candidates those who are preparing for the upcoming exams can use it. Where was the headquarters of International Court of Justice located? Which is the biggest Nuclear Plant in the World? In Which field May Britt and Edward I Moser got Nobel prize? “Ryder Cup” was related to which sport? Where the India’s largest solar power plant was located? Where was the headquarters to IRDA located? Which country has launched the Dongfeng Missile? Which is the Insurance regulation body in India? International Non-Violence day was observed on? Where the next SAARC summit will be held? What is the Mars mission budget of India? Who is the author of the book,” The Dramatic Decade”? Viswanathan Anand was related to which sport? United nations day was observed on? Where is the Venue for next Hockey world cup?